AUSTRALIE – Southport - An archaeological dig to discover the secrets of the city’s first sea wall is taking place this week. Until the formation of The Spit, Southport’s foreshore was sometimes battered by rough seas and storms which threatened to wash away the esplanade and homes, guesthouses and hotels established along Marine Parade. The construction of the protective sea wall began in 1896 and was completed in 1901. From the 1960s, the dredging and dumping of sand at the foreshore gradually saw the burial of the wall and the extension of the shoreline out into the Broadwater. Today, there is only a small section of the wall visible near the existing bridge to Surfers Paradise. What survives of the sea wall on and below the current land surface provides important evidence of Southport’s past. It defines the original shoreline and tells a story of Southport’s former importance as a resort town and the efforts of the community to protect the place from the ravages of nature. CAMBODGE - Angkor Wat - A Cambodian composer has revealed the sound of an ancient harp which has gone unheard for more than eight centuries. The pin harp is shown being played by maidens in the stone reliefs on the walls of the Angkor Wat temple complex. It lends its name to pinpeat orchestras, which perform ceremonial music of the royal courts and temples in Cambodia. 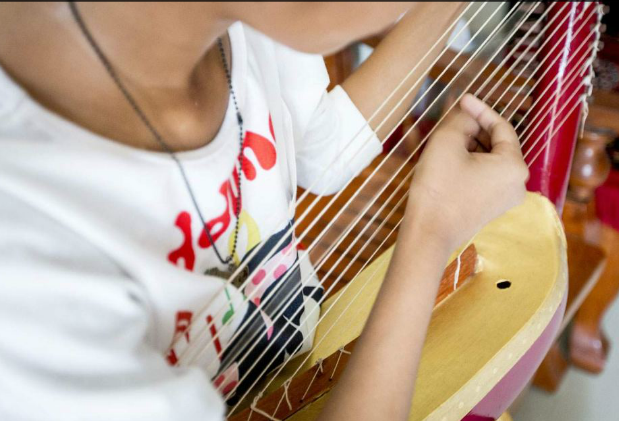 Archaeology lecturer Preap Chanmara says unlike the other orchestra instruments - cymbals, xylophones, flutes and drums - the pin harp has been lost. "We know that there are many music instruments on the sculptures - some even dating back to the time before Angkor Era: the 7th century to the 13th century," he said. "There were many temples and sculptures back then, so there were also many different kinds of music instruments. "Some are still being used today, whereas some others were lost". FRANCE – Montricoux - Importante découverte archéologique au cœur de Montricoux- l'ancienne commanderie des Templiers de Vaour - avec notamment des squelettes et un four à pain. Avec notamment des travaux pour modifier complètement la place Marcel -Lenoir enserrée entre le Donjon des Templiers, l'église paroissiale Saint-Pierre et quelques maisons à colombages, il a été demandé de réaliser un diagnostic archéologique. Celui-ci a été mené par deux archéologues de l'INRAP dont Catherine Viers. D'importantes saignées ont été ouvertes au tracto-pelle et poursuivies plus finement dès que des vestiges sont apparus. Pour l'heure de très nombreux squelettes ont été exhumés, dont la datation par le carbone va être effectuée. Si non loin des églises il existait des cimetières, il se peut que certains ossements aient plus de mille ans d'âge. Car une église a été construite dans ce lieu dès le VIIIe siècle. L'actuelle église paroissiale de Saint-Pierre semblant avoir été érigée sur les vestiges de la précédente entre le XIII et XIVe siècle. Dans une autre partie creusée on a retrouvé aussi un silo à grains creusé dans la terre et non loin des ossements, une poterie qui a toutes les chances d'être un vase funéraire. ALGERIE – Portus Magnus / Bethioua - Le site archéologique “Portus Magnus”, village portuaire romain, situé à Bethioua à une quarantaine de kilomètres à l’est d’Oran, nécessite des actions concrètes pour sa revalorisation, selon les spécialistes. Avec la dynamique économique que connaît la ville de Bethioua, cette cité antique romaine, édifiée entre le 2e et le 3e siècle sur des contreforts et des falaises abruptes, classée patrimoine archéologique. Le site archéologique “Portus Magnus” renferme de nombreux vestiges et monuments nécessitant des fouilles par des archéologues algériens ou étrangers, a suggéré le président d’APC de Bethioua. Un port qui, malgré les aléas du temps et l’œuvre destructrice de l’homme, suscite des curiosités et autres interrogations tant il est vrai qu’il renferme des trésors d’histoires encore ensevelis sous les pierres et autres inscriptions latines. Sa muraille et son forum surtout, renseignent sur le rôle qu’il a joué, comme l’attestent des écrits qui lui présentent comme capitale régionale l’époque de la Maurétanie césarienne. “Nous ne savons que peu sur l’histoire de Portus Magnus. Les quelques écrits qui existent n’évoquent que sommairement le passé de cette cité qui risque de tomber dans l’oubli”, estime, pour sa part, le secrétaire général de l’association de protection des ruines romaines, M. Rahou Ahmed Amine, un jeune étudiant qui milite, lui aussi, pour redonner vie à cette cité millénaire. Une cité dont l’histoire est intimement liée à celle du Maghreb, depuis l’époque berbère jusqu’à l’avènement de l’islam. Cet ancien comptoir phénicien, qui devient un grand port romain Portus Magnus était connu sous le nom de “Arziou” à l’époque berbère jusqu’à la période ottomane. Cambodge - Cheung Ek - The village of Cheung Ek, located just outside the capital city of Phnom Penh, is known today as one of the most famous "Killing Field" sites. The "Killing Fields" were sites where large numbers of people were killed and buried by Cambodia's Khmer Rouge Regime in the 1970s. Recent archaeological work at Cheung Ek by Khmer archaeologists have shown, however, that the Cheung Ek area was occupied from a vastly earlier time period. The early historic site which underlies the Killing Fields is significant as it appears to hold the key to a better understanding of early floodplain polities in Cambodia. Research at the Cheung Ek archaeological site has been conducted in several phases since the year 2000. The findings from the site have slowly developed from one field season to another. Current research at the site has documented 61 kilns, 31 habitation mounds, 11 temple foundations (brick architectural features) and a circular walled site. Two types of kilns were identified at the site: one type fired earthenware and the other fired stoneware. The earthenware kilns date back to 5th century AD; meanwhile the stoneware kilns are suspected to be dated to a later period, even though the results of the dating are still pending. The research at the site has also revealed a circular, earthen wall with a diameter measuring 740 meters long, or about 54 hectares, making it one of the largest earthworks in Cambodia. INDONESIE – Sumatra - The Freie Universität Berlin's "Tanah Datar" archaeological project aims to reconstruct early settlement patterns and document the material culture of the Minangkabau in West Sumatra. During the 14th century, the last Hindu- Buddhist king Ādityavarman established his kingdom in this highland area. Various dated stone inscriptions are the oldest documents for this early phase of history. The potential seat of this kingdom lies on the large mound called Bukit Gombak where settlement features and habitation debris from the 14th and 17th centuries were unearthed in 2011–2012. Excavations at smaller sites and a pre-Islamic burial site including regional surveys provided evidence of a dense settlement pattern in the region. Distributional studies of the habitation deposits offer a number of important observations about the growth of this trading center, the expansion of foreign trade relations, status-related differences and the evolution of craft activity such as metal and earthenware production. GRECE – Messene - For more than 600 years, the ancient theatre of Messene hosted cultural and political events. Great men of the past found themselves in its spaces, such as the king of Macedonia, Philip V and the skilled general of the Achaean League, Philopoemen from Megalopolis. After 1,700 years of neglect and silence, the ancient theatre of Messene re-opens its doors for the public, this summer. 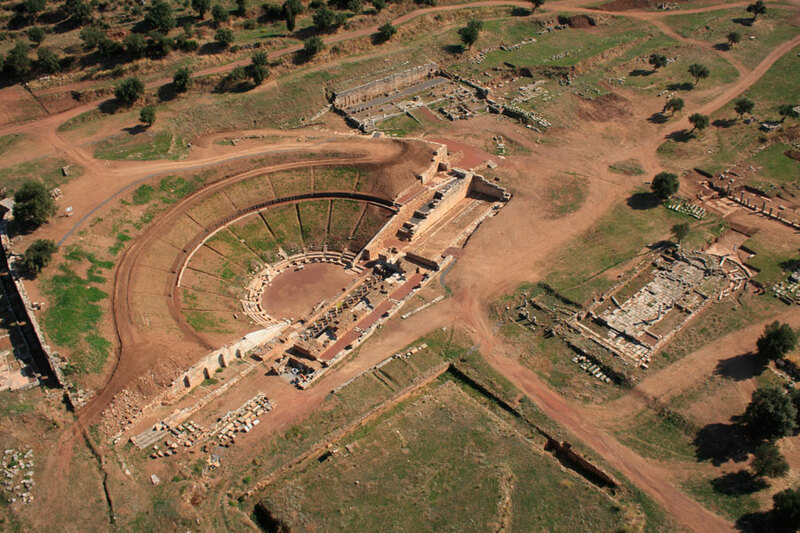 The ancient theatre of Messene re-opens this year for the first time since 300 AD, when it closed down. After operating for six centuries, the theatre was abandoned, it declined and eventually succumbed. “When we first started the excavations, we found ourselves discouraged. The theatre was practically non-existent, the only thing left were some barrier walls and the olive groves surrounding it (…). Huge earth deposits covered the orchestra and the koilon” says Petros Themelis, head of the excavations. The restoration of the ancient theatre lasted more than 20 years. The archaeologists managed to re-unite the scattered pieces and put back to their places more than 2,000 seats. Works at the koilon (cavea) have not been completed yet. They will continue after the summer. Until August 3rd the theatre is expected to be restored up to its 15th row. The ancient theatre of Messene is located at the northwest of the archaeological site of Messene. Its first building phase is dated to the 3rd century BC. The walls of the scene, the proscenium and the orchestra were repaired during the 1st and 2nd century AD. The theatre was used for entertainment events and as a gathering place for political purposes. In the theatre of Messene the king of Macedonia Philip V and Aratus of Sicyon met in 214 BC, a day after the riot of the people and the slaughter of the city’s officials and 200 rich citizens. According to Livius, many citizens of Messene gathered at the theatre demanding that general Philopoemen from Megalopolis would be brought there in plain sight, after being captured by the Messeneans in 183 BC. The koilon rests on an artificial deposit made of a strong semicircular retaining wall. The high pointed posterns and the staircases mounting to the highest levels give the impression of a fortress structure. These elements and the fact that the retaining wall was visible and accessible from outside render the theatre of Messene unique in its kind and a precursor of the colossal theatres and amphitheatres of the Roman era.